Destroy Dengeir's risen ancestor, the vampire Vighar. Speak to Dengeir of Stuhn. Battle through and kill Vighar. After stealing Lod's letter for Dengeir, he'll trust you enough to handle an important matter. It is of great concern and embarrassment to him that his ancestor Vighar is actually a vampire. For years he was magically bound within his grave, but the magic energies weakened and allowed him to escape. When asked, he will tell his family secret: "You may have seen the open grave in our graveyard. Most of the townsfolk think it's the work of a corpse thief. The truth is less pleasant. It is...was, the grave of Vighar, my own ancestor, dead for centuries now. He is also a vampire. My family is entrusted with keeping him buried, but recently someone stole the wardstone, and Vighar escaped." However, he is not interested in the stone, he just wants Vighar destroyed. "No. It's too late for the wardstone. Vighar must be destroyed. If this gets out, my family will suffer great shame." Dengeir has tracked him down to the vampire lair Bloodlet Throne and wants you to head there and destroy him before anyone discovers his family's secret shame. Bloodlet Throne is a military fort hidden in the mountains southwest of Helgen. Travel to Helgen and leave through the east gate, taking the path leading southeast. Keep an eye on your map marker and make sure to take the right turns; never stray off the path, as it will lead directly to the fort. The exterior of the fort is unguarded, so climb the steps and enter. Once inside, the sound of howling wolves will meet you, along with a pressure plate triggering a flame trap right in front of you. Enter sneak mode and proceed forward. Before long, you will encounter two leveled vampires; pick the fight and proceed down the stairs into a large chamber. Take the eastern path and fight another vampire, feasting on severed hands in the dining room. Follow the snowy tunnel to yet another huge chamber with big wooden structures and more vampires, along with the expected wolf. Climb the woodworks and use the Arcane Enchanter and, in the next tunnel, the Alchemy Lab, then investigate the sleeping area for a bit of loot and a door leading to a room with the Illusion skill book Incident at Necrom and a random enchanted dagger on the table. Proceed to the snowy tunnel leading south and cross the bridge leading to Vighar in the final chamber. Vampire: "And who is this?" Vighar: "It is no matter, this fool will be the next act of the show." With these words, Vighar will pull the handle by his side and cause several wolves to be released from their cells. He will coldly observe while you fight them. As soon as you manage to kill them, Vighar himself will jump down and attack, backed up by his companions. When all is said and done, locate the pull chain in the western alcove and head upstairs. Follow the path to a chest with some loot, then remove the door bar and gain access to the first huge chamber. Exit Bloodlet Throne and return to Dengeir for your reward. Vighar is a very tough vampire, on par with Master Vampires or Volkihar Master Vampires. He will replace the normal end boss of the dungeon. This quest is not available if Dengeir is Jarl of Falkreath. 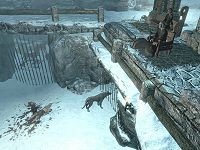 If the Dawnguard add-on has been installed, Bloodlet Throne will have three hostile gargoyle statues added and the wolves will be replaced with death hounds. Dawnguard may only add the gargoyles and not change the wolves to death hounds. At times, even if the quest has been started, Vighar may not appear. Instead, the final boss of the dungeon is the random high-level vampire who is supposed to be there if the mission has not been triggered. This does not seem to prevent the successful conclusion of the quest, since Dengeir will act just like you had killed his ancestor and not notice the difference. On the PC, it is possible to use the console to advance through the quest by entering setstage FreeformFalkreathQuest03 / FreeformFalkreathQuest03B stage, where stage is the number of the stage you wish to complete. It is not possible to un-complete (i.e. go back) quest stages, but it is possible to clear all stages of the quest using resetquest FreeformFalkreathQuest03 / FreeformFalkreathQuest03B. This page was last modified on 9 December 2017, at 09:06.